Get the bear above the candy string. You have only 70 moves. This level have normal difficulty and you need to use good strategy to complete this level. For this level you should try to play from bottom part of the board. 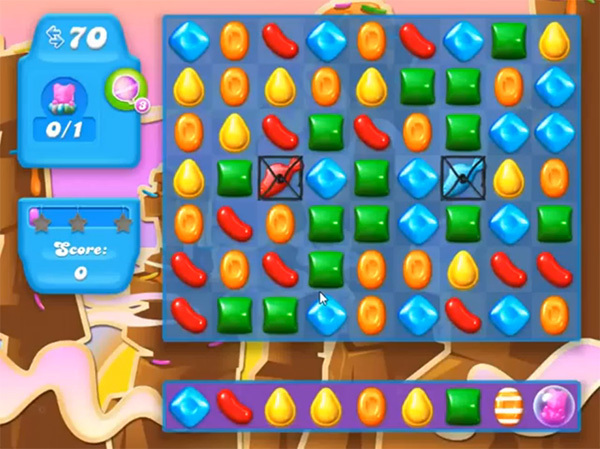 As you will play from the bottom it will shuffle candies everywhere and will give chance to make colorbomb that you could get by combing five same color candies or make fish to break the grills to increase the soda. This will help to take bear to the top. Play above the bear by breaking candies to take bear to the rope.